When it comes to flowers and gardening, the choice you have is big. You can choose between many types of flowers, all beautiful in their own way. They all require different conditions in order to grow well, so it’s up to you to see which one suits your needs the best. In this article we are showing you ten types of flowers that like shady locations. Partial or full shade, these all will make your garden a very beautiful place with their bold colors and lovely shapes. Check them out and let us know which one you would like to plant in your garden. The hardy geraniums bloom in late spring and they last until fall – they will make your garden look pretty the whole summer! 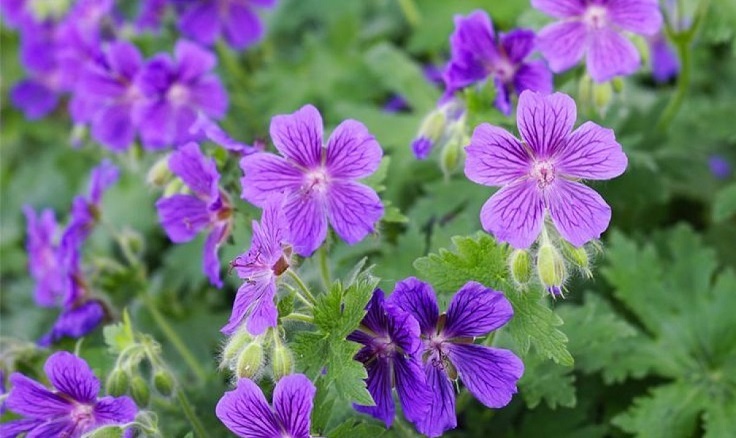 There are many varieties of the hardy geraniums and each requires its own conditions, but they all should be planted with the flower crown at soil level, in a fertile and moist. They become somewhat drought – intolerant as they grow, however you will still need to water them occasionally. I agree. I was confused until reading your statement. Also, I personally feel that there are other flowers that are shade tolerant that maybe better choices depending on personal preference. not seeing the names of the flowers. would be helpful. thanks! The only shade loving perennial I see is the geranium. You need to search for the next button. On the first flower it was way down the page, on the rest I found them below the discription. Hope this helps.